Part of the income from this product goes to a charitable cause. You`ve ridden them... you`ve watched them roll across the landscape... you`ve played with them... now build your own virtual train set with this first pack of train cars! That`s right- now you can build train layouts (and render your own images) from within Poser. These are no ordinary, bland, train cars- they were specifically designed for you, the Poser artist: simply purchase the product, extract the files, open Poser, and you`re all set! 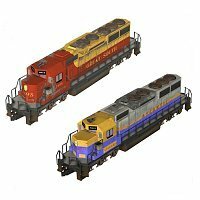 This product includes 7 train cars, 1 section of railway, 3 textures/ MAT poses per train car, 1 texture for the railway, 6 resize poses for the train cars, 6 resize poses for the railway, and templates for all the models. Boxcar: contains 19,484 polygons; front and rear wheel carriages can rotate, side doors can open and close (front/ back). Caboose: contains 15,005 polygons; front and rear wheel carriages can rotate, front and rear doors can open and close (rotate). Coal Car1: contains 14,961 polygons; front and rear wheel carriages can rotate. Coal Car2: contains 19,158 polygons; front and rear wheel carriages can rotate, hopper lid can open and close (left/ right). Engine: contains 20,791 polygons; front and rear wheel carriages can rotate, cabin doors (1 front, 2 rear) can open and close (rotate). Flat Car: contains 16,746 polygons; front and rear wheel carriages can rotate. Rail Section: contains 540 polygons; no moving parts. See below for more information on the rail model. Tanker Car1: contains 19,493 polygons; front and rear wheel carriages can rotate. All models come with superb, detailed textures with more free textures to be released later. All models come with MAT poses to quickly apply the textures- there`s no need to manually browse for texture files. All texturing is compatible with Poser 4... though there are some extra details when you load it in Poser 5 (and above). Not to worry... even though Poser 4 will safely ignore this information, there will be no significant loss of detail. Full-size pose: resets the size of the model to 100% scale. "O" Scale: resizes the model to the approximate size of a "O"-scale toy train. This is the size of the "Lionel" branded toy trains. "S" Scale: resizes the model to the approximate size of an "S"-scale toy train. "HO" Scale: resizes the model to the approximate size of an "HO"-scale toy train. "N-Gauge" Scale: resizes the model to the approximate size of an "N-Gauge" toy train. "Z" Scale: resizes the model to the approximate size of an "Z"-scale toy train. This is the smallest scale toy train.
.: Features and Benefits :. Like all Poser figures, when you extract these models, they are added to your Figures Library and you are ready to go. There is no need to fiddle around with any import options. These models are perfectly scaled to the Poser people. There is no need to fiddle with the scale and translate dials to resize the model. All of the train cars include moving parts, such as rotating wheel carriages and opening and closing doors. Imported 3ds and obj files can not have moving parts. Like all Poser figure files, these models accept pose files: both position files and MAT poses. This means, that when you can make your own textures, your MAT pose to apply the texture will work fine. Imported 3ds and obj files can not accept MAT poses. Each model contains easy-to-understand material names in English, such as "Exterior" and "Interior". You will not find materials with names such as "Abbax_1" or "auben" or "panneaux lat�raux". Each model uses logical material names for the surfaces, such as "Exterior", "Glass", and "Ladder". You will not find materials with names such as "Material_1" and "Material_2". Each model uses "material conservation" and uses as few materials as possible. Unlike models designed for use in Lightwave or 3D Studio Max, these models do not use 20 surface materials just to cover the "Exterior" section. All models were built with 3 and 4-point polygons. There are no multi-point polygons to cause potential rendering issues. All models use externally-referenced obj files. This saves memory resources since Poser can load the obj file without having to re-create the model`s geometry each time it`s added to the scene. All models were tested in Poser 4 and Poser 6, but will work perfectly fine in Poser Pro Pack, Poser 5, Poser Artist, and should work fine in all future versions of Poser. The models may work in Poser 3, but we are unable to test this... and we recommend that you upgrade to at least Poser 4. NOTE: Even though the obj files can be used in other graphics programs, we do not actively support the usage of the models in any software other than Poser. We will try our best to help you, but we can`t guarantee that we`ll even have the same software as you. The materials are laid out in an easy-to-understand fashion. You can easily make your own textures by using the included templates (or by making your own templates with any mapping program) and by using the included textures as examples. Use the "full-size" pose to create scenes with the Poser people on or around the train. Use the "toy train" poses to create a train layout on a table, on the floor, or even beneath a Christmas tree! Or use the "toy train" poses to create scenes of children playing with trains... or scenes of train enthusiasts working on their train layout. The "US standard gauge" size dates back to the original railroads, and some people claim the size dates back to the time of Roman chariots! But, no, there is no truth to the legend that the US` space shuttle`s solid rocket boosters (SRB) were designed to be the same width as railroad rails... and, in turn, the same width as the Roman chariots. Yes, the SRB`s are moved on trains, but they`re designed to fit through train *tunnels*, which are significantly wider than the rails` width of 4 ft 8 1/2 inches. Part of this product`s income will be donated to the Baltimore & Ohio Railroad Museum... the birthplace of American railroading! Note: The Wirefusion models are shown with rails beneath the train cars. Rest assured that the rails are a separate figure and NOT modelled onto the train cars.